Want a stock that has the traits for decade-long returns? Take a look at U.S. Bancorp, First Solar, and American Water Works. If you're a long-term investor, you have to think on an investment time scale that is more than a year or two away. The greatest investments are the ones that can generate positive returns for decades into the future. It sounds simple at first, but when you start asking yourself questions like, "Where is this company/stock in 2025?" it becomes much more difficult . So, we asked three of our contributors that very question. Which companies do you see generating great returns for investors all the way out to 2025? Here's a quick rundown as to why they picked retail bank U.S. Bancorp (NYSE:USB), solar panel manufacturer First Solar (NASDAQ:FSLR), and water utility American Water Works (NYSE:AWK). Jordan Wathen (U.S. Bancorp): One of the best-managed banks in the country, U.S. Bancorp has been left out of the post-election bank stock boom. That's no fault of its own, though. After provisions for losses, U.S. Bancorp enjoys a roughly 50-50 split of interest income and fee income, making its earnings less sensitive to rate increases like other banks that have seen their share prices surge. I think investors are undervaluing the downside protection afforded by diversified sources of fee income, and overvaluing the potential for higher rates to fuel bank profits. In effect, investors are placing too much importance on what makes banks great over the short term rather than what makes them great over the long haul. U.S. Bancorp's historical underwriting performance tells the tale of its conservative culture. At the depths of the financial crisis, net charge-offs peaked at 2.17% of average loans in 2010. Though it may seem unremarkable on an absolute basis, consider that "retail loans" made up 33% of its loan book at the time, a majority of which were clustered in credit cards and home equity loans that ravaged banks across the country. U.S. Bancorp can play offense, too. Its deposit franchise gives it pricing power to hold down its cost of deposits, which recently averaged just 0.28%. On the asset side of the equation, its commercial loan portfolio should generate incremental income from rate increases. On a recent conference call, a bank executive pointed out that its commercial customers were using an average of 25% of their credit lines. One would expect that faster economic growth could bring higher balances, higher benchmark interest rates, and more interest income. U.S. Bancorp has everything investors could want in a bank to hold for years at a time. Tyler Crowe (First Solar): The solar industry is a difficult-to-understand, and at times frustrating, industry to follow. That's because it's both a high-growth and a cyclical industry at the same time. The problem is, too many investors simply look at it as the former and neglect to remember the latter. While overall solar power consumption grows at near-exponential rates every year, panel manufacturers like First Solar go through fierce supply-and-demand cycles as new capacity and new technology come online. This past year is a great example of an industry downturn. The industry is still growing, but it hit a patch of slower growth recently that brought down prices for new panels and utility-scale projects. However, the industry is expected to pick back up again in earnest as renewable sources such as solar have moved so far down the cost curve that they are now competitive with fossil fuel power plants even without subsidies. As technology improves, costs will continue to decline, and solar will be able to take a larger market share and expand margins. Keep in mind, global electricity demand over the next 25 years will require that we build 8 times the current generation capacity in the U.S. This gives First Solar an immense growth runway over the next decade, and it is one of the best-positioned panel manufacturers and utility-scale power developers out there to reap rewards from this opportunity. The company has one of the most pristine balance sheets in the business, its low-cost, thin-film solar panel design is rapidly improving its efficiency metrics, and it is one of the only companies in the business whose returns on invested capital have outpaced its cost of capital -- which is essential for a company to grow and create wealth over time. The solar industry still very much looks like the wild west of energy, with new entrants rising and falling quickly, but First Solar is looking like the company that has the potential to turn this fast-growing market into one that really generates long-term returns for investors. Since its April 2008 IPO, American Water's total return of 376% has crushed the S&P 500's return of 108% and pulverized the returns of popular stocks IBM and General Electric. Moreover, it's also beat the 212% return of Google parent Alphabet over this period -- and in April 2008, this tech stock was less than four years off of its hot IPO. These stats should help dispel the widespread belief that all utility stocks are stodgy slow-growers. 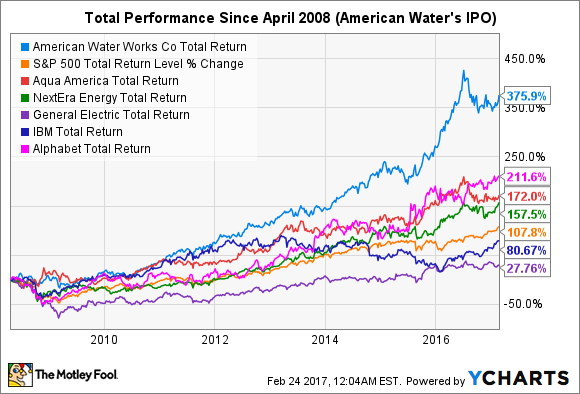 Moreover, American Water's return leaves underwater the solid 172% return of its closest peer, Aqua America, while also significantly beating the 158% return of the largest electric utility on the S&P 500, NextEra Energy. I'm confident American Water's winning streak will continue over the long term. The company supplies the most essential product in the world, and it's the largest and most geographically diverse player in its industry. These latter attributes provide it with greater resources and opportunities than its peers to more efficiently expand its regulated business by acquisitions. The water industry in the U.S. is extremely fragmented, which means the potential acquisition pool (pun intended) is a very large one.